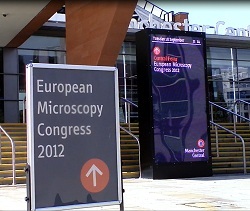 ORGANISERS are claiming a major success with the European Microscopy Congress 2012, held in Manchester UK this week (17-21 September 2012). Traditionally considered a meeting rooted in electron microscopy, EMC2012 had a new, ahem, focus on light microscopy thanks to the involvement of the UK Royal Microscopy Association (RMA) in the organisation, alongside the European Microscopy Society (EMS). Held only every four years (the last was in Aachen in 2008, the next in Lyon in 2016), this is the most important event on the European microscopist’s calendar. Attracting over 1500 delegates to hear 300 oral presentations and view 800 posters and around 80 workshop sessions, the academic programme certainly reached its targets. The accompanying exhibition, held in the converted railway station now known as Manchester Central (formerly the GMex centre), attracted 130-odd exhibitors to demonstrate their latest microscopes, accessories, and related products and services. Olympus used the platform of EMC2012 to launch its new IX3 series inverted microscopes (see full story), with the entry-level IX53, general purpose IX73, and high-end IX83. Aimed at the live cell imaging and clinical analysis markets, these new instruments feature swappable optical cartridges or decks, enabling them to be configured and reconfigured for multiple applications. Although not new at this event, Leica was also showing the latest microscope in its range. The TCS SP8 confocal microscope was launched just a few weeks earlier (more information here). Claiming the fastest true confocal scanner available today, with speeds of up to 428 frames per second, along with the most sensitive detection system on the market, the new instrument offers an upgrade path to Leica’s ‘super-resolution’ technology. Being shown for the first time in Europe was Hitachi High-Technologies’s SU3500, which the company describes as a new type of premium variable pressure scanning electron microscope (VP-SEM). It’s new low-aberration objective delivers ‘incredible’ imaging, especially at low voltages, the company says, while a new electron gun and image processing provides the highest signal-to-noise for imaging clarity (full story here). A partnership between Nikon Metrology and Jeol used the event to launch its latest desktop scanning electron microscope, the NeoScope JCM6000. This latest version of the desktop SEM offers magnification up to 60,000x, and has the option to add an energy dispersive X-ray spectrometer (EDX) to enable operations like elemental analysis. The companies say these features further erode the difference between the relatively low-cost desktop SEM and high-end research electron microscopes. A new range of LED light sources for light microscopy was launched by CoolLED at EMC2012. The pe-200 and pe-300 are designed as direct replacements for high-pressure mercury lamps, delivering two or three wavelength configurations respectively, while a range of adaptors allow them to be fitted to a wide range of current microscopes as well as older models. In the laser realm, Fianium launched what it says is the world’s first supercontinuum laser generating broadband light into the UV. The full spectrum of the WhiteLase UV extends beyond 2400nm, while the cut-in wavelength is below 390nm, with output power of 1.5W or 3.0W. Deben was demonstrating its latest wide-angle CCD camera for transmission electron microscopy (TEM), the AMT XR16 ActivVu, offering up to 16Mp resolution. The wide field of view and high sensitivity of this camera are said to make it ideal for life sciences and biotechnology imaging applications. While CCD sensors remain the market leader in microscopy imaging, Hamamatsu says that its CMOS cameras continue to erode their advantage and offer their own particular benefits especially for fluorescence imaging. The company launched its second-generation CMOS camera, the Orca-Flash 4.0, at EMC 2012. The company says the combination of low noise and high quantum efficiency gives the device unprecedented sensitivity, a high dynamic range, high speed, and a wide angle field of view. Resolution of this camera is 4Mp. Among the other news products and services on display at the European Microscopy Congress 2012 that caught our eye were the following. New company Ellcie has an innovative vacuum reservoir system for electron microscopy that it says offers energy savings of up to 90 percent, along reduced vibrations and improved local environment. Electron microscope turbopumps require a moderate vacuum to be applied to their exhaust port, which is usually provided by a rotary vane backing pump. The Smart Vacuum Reservoir offers an alternative way to provide the exhaust vacuum, from an evacuated cylinder, meaning that the rotary vane pump need only operate to ‘charge’ this reservoir and can then be switched off. Oxford Instruments was demonstrating the OmniProbe 400 nanomanipulator, the latest product from OmniProbe which Oxford Instruments absorbed in 2011. This device offers four degrees of freedom and claims an impressive motion resolution of just ten atoms. We also noticed the range of climate control chambers for light microscopes offered by Solent Scientific, including its new full enclosure incubator for the Leica M205FA fluorescence stereo microscope. This shows that innovative and useful new innovations for this most high-tech of instrument sectors can still themselves be relatively low-tech.